The Seattle Mariners have not had an easy go of it. In 41 seasons of existence, they have scuffled to just three division titles and a .470 winning percentage, tied with the Marlins for fourth-worst winning percentage of all time, and with the Brewers for the fourth-fewest first-place finishes. They’ve had some truly transcendent players in their years, from the ’90’s of Ken Griffey Jr. and Alex Rodriguez and Randy Johnson and Edgar Martinez to the ’00’s of Ichiro to the 2010’s of Felix Hernandez. And there have been plenty of joyous Jay Buhners and Jamie Moyers and John Oleruds and Kaz Sasakis to watch, as well. But too many of their teams have ultimately failed to cohere, finishing the year as something less than the sum of their parts. And their struggles to staff left field may help point to why. Since 2013, I have written several pieces evaluating the way a particular team has filled a particular position over the past several decades. You can see them in the sidebar at the right. While front offices change, managers and field personnel change, and the game itself changes, I find these deep dives fascinating, and hope that you do as well. In the last 41 seasons, 175 men have grabbed their glove and trotted out to left for Seattle. Just 16 have started as many as 100 games there for the organization, and just four have started at least 200: Ibanez, Bradley, Randy Winn (whom the Mariners obtained from the Rays in return for their manager, Lou Piniella), and Greg Briley, an undistinguished platoon left fielder who never once in his career had a 100-start season. Okay, okay, you get it: across numerous organizational changes over the decades, the Mariners have never seemed to believe in consistency in left field. And maybe that’s just fine: it’s an offense-first position, it’s where you stick players who don’t have an arm and don’t have a glove but aren’t valuable enough as hitters-only to take up a DH slot. I found in my Mets case study that the Mets used second base as an overflow position, solving roster logjams by placing players there even if they might have been more valuable elsewhere, from Edgardo Alfonzo and Kaz Matsui to Jose Reyes and Daniel Murphy. It probably makes even more sense to do that with left field. But the Mariners take it to an extreme. 1977 was mainly expansion draftees who didn’t work out, as Dave Collins and Steve Braun combined for -0.6 team WAR at the position. In 1978, the team used a four-man committee: free agent signees Bruce Bochte and Tom Paciorek, who were actually pretty good, but whose solid work was largely offset by the soon-to-retire Leroy Stanton and the dreadful John Hale, who combined for a rather astonishing .423 OPS in 148 PA. That led to a -1.0 WAR from left field. For 1979, the team solved its problems with left field production by shifting Leon Roberts from right to left, and they got 4.3 WAR from left. Unfortunately that meant that Joe Simpson moved to right field, and he couldn’t hit no matter where he played. For the first time in franchise history, in 1980, Dan Meyer got to the century mark in left field starts. But that doesn’t mean he was good: his career WAR was -5.4, 18th-worst of all time, and the team got -0.7 WAR there that year. So the team turned back to Paciorek in 1981, and he had the best year of his career, making his way to the All-Star team and finishing 10th in the MVP vote thanks to a gaudy .326 average; the team got 4.4 WAR there that year. So that offseason, the team sold high, trading him for Rod Allen, Todd Cruz, and Jim Essian. Sadly, none of the three had success in their new uniform. So in 1982 the team went back to Bochte, who had been their everyday first baseman for three years and was an All-Star in 1979. He was good but his platoonmates weren’t, as Joe Simpson and Bobby Brown upheld the team’s mystifying corner outfield tradition of providing low OBPs with no power; it added up to 1.8 WAR. In 1983, much like 1978, the team surrounded a pretty good Steve Henderson (who made 111 starts!) with a wretched hive of villainy who put up a .524 OPS in 204 plate appearances, and just 0.5 WAR for the team overall. It was the same story in 1984: Steve Henderson and Barry Bonnell contributed adequate (if stone-gloved) production, while four of their teammates combined to hit poorly, a .562 OPS in 275 PA. They got -0.3 WAR in left that year. In 1985, as it happened, one of the hapless crew from 1984 finally emerged as a reliable option: Phil Bradley, who had spent more of the previous year in center than in left. He played 159 games, mostly in left but still with 29 games in center, and hit .300 and made his only All-Star team. Also, his main platoonmate Ivan Calderon quietly tore the cover off the ball, contributing a .961 OPS during 32 games in left, for a team total of 6.1 WAR. But 1986 was a down year from Bradley; he hit .300 again, but his home run total fell by half and his defense suffered as well, and his teammates weren’t quite as productive as Calderon had been. Still, the team got 1.6 WAR from the position, more than it had gotten in most of the prior years. In 1987, Bradley’s production incrementally improved and he played nearly every one of the Mariners’ games in left. The team’s 3.1 WAR in left field in 1987 would be its best mark until 1996. As they had with Paciorek, the Mariners traded Bradley in the offseason and got three players in return. The best was Mike Jackson, a reliever who had a few good years for them. 1988 featured a four-man platoon led by Mickey Brantley (team WAR: 1.8), while the lead starter in 1989 was Greg Briley (2.0 WAR) and in 1990 it was Jeffrey Leonard (1.3 WAR). Neither good nor bad. Ken Griffey Sr. got a few reps in left in 1990 and 1991, but not enough to matter. The 1991 squad had its platoon anchored by Briley again, but while seven different men got significant playing time, the sum total of the production was wretched, a -2.0 WAR that was the worst in franchise history — though it would be exceeded two years later. 1992 brought a mere reprieve to mediocrity. The playing time leader among seven men was Kevin Mitchell, who had come over in a trade for Mike Jackson, who had been the main return for Phil Bradley; Mitchell had been NL MVP three years prior, but he had a horrible year in Seattle, producing at replacement level and leading the team to 0.1 WAR from the position. Mitchell was still far better than Mike Felder, who anchored the six-man 1993 platoon while hitting a .545 OPS in 317 plate appearances in left, leading the team to an astonishing -3.2 WAR. Eric Anthony scarcely helped matters in the abbreviated 1994 strike campaign, as he couldn’t field or hit and led the team to -1.9 WAR from left field. For the first time since 1981, a large platoon in 1995 yielded a surprisingly decent 2.2 WAR, with playing time spread fairly evenly among Vince Coleman, Rich Amaral and Darren Bragg. That team also won the first division title in franchise history. The revolving door exploded its production in 1996, with Bragg and Amaral joined by the thump of Mark Whiten and Brian R. Hunter (the heavy power-hitting one). The 5.8 WAR that year was the team’s best since Bradley in 1985, and remains third-best in franchise history. The 1998 platoon was a return to the team’s production earlier in the decade, as Glenallen Hill could hit a little but couldn’t pick it, and Shane Monahan couldn’t do much of either; the team’s production was barely above replacement-level, 0.9 WAR. In 1999, the main left fielder was the other Brian Hunter, Brian L. Hunter (the fast base-stealing one), and he just couldn’t hit, which is the main reason the team received -1.1 WAR from the position that year. Then, in 2000, it was mainly 41-year-old Rickey Henderson, who couldn’t do much other than draw walks, but he did that well enough to pull the team’s production into narrowly positive territory, 0.9 WAR again. Just about everything went right for the 116-game-winning Mariners in 2001, of course, and a big part of the reason was the brilliant play of LF/3B/SS Mark McLemore, who combined with Stan Javier for very effective play on both sides of the ball. (Al Martin actually had more appearances in left than either, but his performance was only slightly positive while theirs was hugely positive.) The 7.0 WAR the 2001 platoon posted remains the best left field mark in team history. The decline in 2002 was relatively gentle, as McLemore picked up more of the slack and Ruben Sierra became his main platoonmate, combining for 3.3 WAR. In 2003, the starting left fielder was Randy Winn, the compensation the M’s asked in return for allowing their manager, Lou Piniella, to go to Tampa Bay. Winn was plenty good, helping the team to 3.6 WAR, but considering that the team hasn’t been to the playoffs since losing Sweet Lou, the Mariners may not have gotten enough in return. 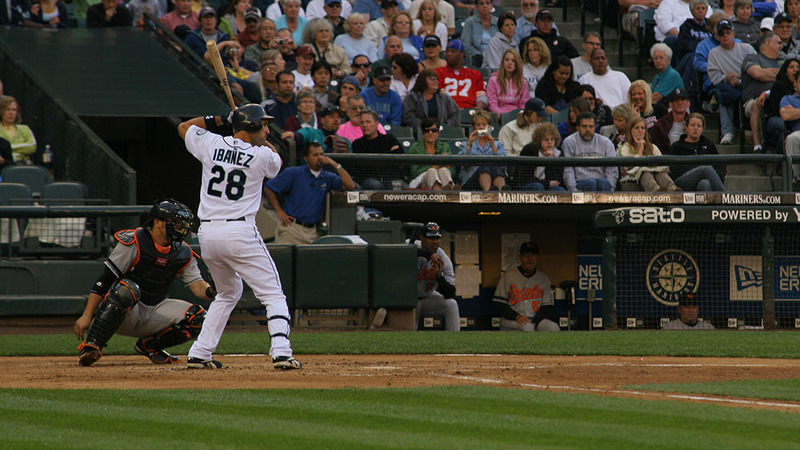 While Winn was the starting left fielder in 2003, in 2004 he moved over to center field to accommodate an old friend who had come back as a free agent: Raul Ibanez. He was exactly what the team had lacked since Phil Bradley: a consistent, reliable, everyday option. The team got 2.6 WAR from the position in 2004 and 4.1 in 2005 (although the Mariners couldn’t help themselves, mostly moving Winn back to left and Ibanez to DH that year). Ibanez departed as a free agent, and the team was back to the drawing board, and back to its old habit of putting together random, massive platoons. The 2009 one was led by Endy Chavez, Bill Hall, Wladimir Balentien, Ryan Langerhans and Michael Saunders, none of whom particularly hit well but all of whom could field a little. That was good for 1.0 WAR, but the in 2010, Saunders and Langerhans hooked up with Milton Bradley for an overall negative -0.2 WAR. The 2011 crew was a six-headed monster of Bradley, Carlos Peguero, Mike Carp, Casper Wells, Trayvon Robinson and the late Greg Halman; they couldn’t really field or hit and they combined for -1.9 WAR. In 2012, Carp, Saunders, Wells and Robinson were back, and this time they were joined by Chone Figgins; the defensive boost of losing Bradley was nearly enough by itself to bring the production back to a replacement-level 0.2 WAR. They were exactly at 0.0 in 2013, when a 41-year-old Ibanez returned and more or less precisely offset his fine bat with his atrocious defense. But things started turning around. In 2014, former top prospect Dustin Ackley enjoyed his best full season in the majors, moving from second base to fill the hole in left and performing adequately, 1.9 team WAR. 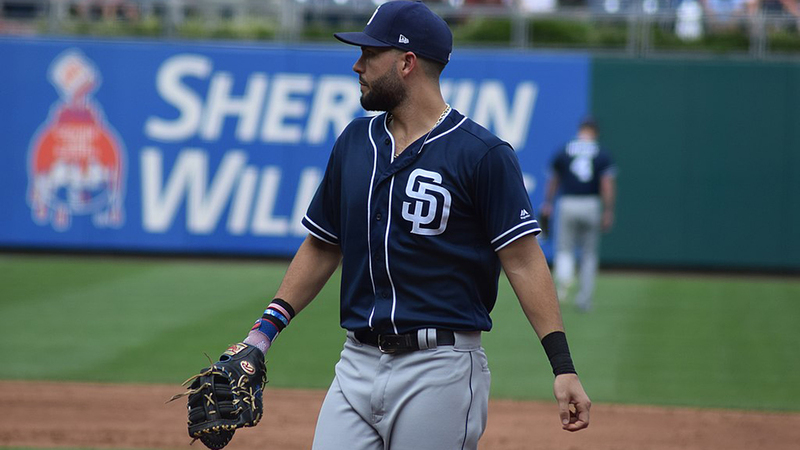 In 2015 they moved him back to play some center and some second base, and gave more of the left-field starts to Seth Smith, Franklin Gutierrez and a trio of former infielders in Mark Trumbo, Rickie Weeks and Brad Miller. (At the deadline, they traded Ackley for a prospect and a reliever, Jose Ramirez.) Random as the assortment was, Gutirrez and Smith were terrific and the team received 3.2 total WAR. Smith’s defense nosedived in 2016, as he backed up new free agent Nori Aoki, but the two combined with Guillermo Heredia for another 1.8 WAR. In an August 2016 trade with the Yankees, the Mariners got Ben Gamel, and in 2017 they made him their primary left fielder, and he and Heredia combined for a perfectly decent 1.4 WAR. For 2018, Gamel and Heredia sat atop the organization’s depth chart in left field, but now Gamel’s out for up to six weeks with an oblique strain, Heredia’s recovering from his own injury, and Seattle has reportedly reached into its past with Ichiro. It seems certain that the team will juggle again in left. There’s nothing inherently wrong with treating left field as a revolving door and an open casting call. Since time immemorial it’s been a place to hide a player with a good bat and an indifferent glove, or to test out a cheap Quad-A prospect to see if he can handle the majors, or to shift a guy who lost a battle for a more important position. And when a player performs well, it makes sense to try to move him to a more important outfield position, or to sell high and trade him. In a couple of cases, as with Phil Bradley and Raul Ibanez, it worked perfectly. Imports like Winn, and the occasional platoon, also admirably filled the position. It’s possible that the Mariners have made a conscious decision to focus on other positions on the diamond first and punt on left field until later. Even if it hasn’t been set in stone as the Mariners Way, it’s the strategy that they’ve displayed for their entire history as a major league organization. And that’s probably exactly appropriate. But it only works if your player evaluation staff can help you avoid sub-replacement-level production. Far too often, the Mariners have been let down by their people. That isn’t every player who played an inning in left field for Seattle; it’s just the players who played significant innings in at least one season. As in my Cubs case study, I generally defined that as at least 10 starts in a year in which no one started 100 games in left, or at least 20 starts in a year in which one player started at least 100 games in left. Also, unlike my other case studies (each of which I arbitrarily chose to begin in 1980), because the Mariners are such a young franchise, I looked at their entire history as an organization. 6’10’ pitcher Randy Johnson played left-field for the final inning of 1993. 5’9″ Omar Vizquel played in-front on him at shortstop with no injuries or near-misses. This was a day after Ken Griffey Jr. made the first of his two career appearances at first-base. I suspect manager Lou Piniella was humoring his superstars with these moves. Fascinating article. Shows what a good manager Pinella was to wring 7 WAR from a platoon of Al Martin, Stan Javier, and an aging Mark McLemore and Jay Buhner. Jose Rey joins the ranks of Johan Santa and J.D. Martin. If you watched Ibanez field left in 2004, you wouldn’t have been able to help yourself either. I know UZR rated him +9 runs but that’s a goddamn lie. To be fair, I think he made a bad first impression by following after Cameron CF / Winn LF, and by looking like an oaf early in the season. But his range was not good, and his routes were not good. His arm, despite the GIFs, was the best part. I think that young Ken Griffey Jr. In 90 and 91 who didn’t get enough reps to matter was actually old Ken Griffey Sr. Yes, you’re right. I just double-checked. I will fix.